Happy Friday! This weeks Bloggers Challenge is Wave the Flag (or Red, White & Blue). If you'd like to play along with this weeks challenge, leave a link to your card in the comments section, I'd love to see your RWB cards! Now before I get to the deets of my card, I know what you're thinking...Lot's of layers! Yep, I'm the queen of layering, it's a struggle for me not to add the layers! 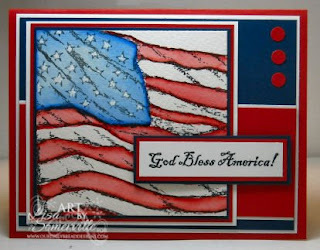 To create my card I stamped a portion of the Flag from Our Daily Bread Designs God Bless America in Black Archival on Watercolor paper and colored using the Marker Watercoloring Technique. Before I colored the Blue, I applied White Gel Pen to the stars, so they would resist the ink. Be sure to click on the Bloggers Challenge Logo on my sidebar, to see what the talented Challenge members created this week! Don't forget to check back tomorrow, as I'll be posting my Red, White & Blue card for the SNR Card Universe Blog Hop, I'll also have a chance for you to win some Blog Candy! The watercolored flag is stunning, Lisa. You know I love layers, too, Lisa! Great job...beautiful coloring as usual. You have that technique mastered! Great card, love all the layers. I find that I like all the layers too! Lisa card is gorgeous. I feel like I can actually see it waving in the wind. Great job! Very striking card. The flag looks fabulous on this card. Awesome card, Lisa! I love the color blocked background and the flag is really cool too! What an awesome card - I just love it!! Gorgeous card and watercoloring,Lisa!! Love that stamp too! Gorgeous card...yes you are the queen of layers but it always looks so right!!! I love the colorblocked background. It's the perfect canvas for the watercolored flag. Truly stunning! Fabulous card....but with all that layering, I bet you'll need to hand deliver it! This card is just breathtaking!! I love that flag and all your layers are awesome!!! Wonderful card! Love the feel of it! oooooh! aaaaah! this is pulchritudinous!